Excerpt from U.S. Coast Guard Proceedings of the Marine Safety & Security Council magazine by CDR Hal R. Pitts, former Waterways Manager, U.S. Coast Guard Sector Houston/Galveston; Mr. Raymond Butler, Executive Director, Gulf Intracoastal Canal Association; and Ms. Tava Foret, Chairperson, Houston/Galveston Navigation Safety Advisory Committee. Recently USCG Sector Houston/Galveston personnel and the Houston/Galveston Navigation Safety Advisory Committee created a program to increase their understanding of the inland towing industry. Unlike mariners who ply their trade in open ocean or “blue” water, inland mariners who navigate the “muddy Mississippi” and other “brown” water have unique concerns. Pictured: CAPT William J. Diehl, commander of USCG Sector Houston/Galveston, welcomes the March 2009 class of Brownwater University. One challenge was deciding how to structure the curriculum and how much information to present in each topic area to keep BWU within the agreed length of two days. The inaugural class consisted of 40 Coast Guard personnel from Sector Houston/Galveston and Marine Safety Units Port Arthur, Lake Charles, and Galveston. Course critiques were favorable overall. Although rough around the edges, Brownwater University was a step in the right direction. BWU has been revised and the target audience has expanded to include personnel from the inland towing industry, other government agencies, congressional staff members, Coast Guard personnel throughout the Eighth Coast Guard District, and representatives from Coast Guard Atlantic Area. Pictured: Captain Jerry Torok of American Commercial Lines provides simulator instruction as MST3 Emily Fulbright works the controls. 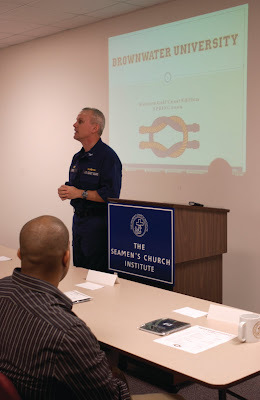 The combination of students and presenters from the Coast Guard and the inland towing industry has improved the training forum and created opportunities to strengthen relationships, particularly for new personnel or Coast Guard personnel with limited experience in the Gulf region. 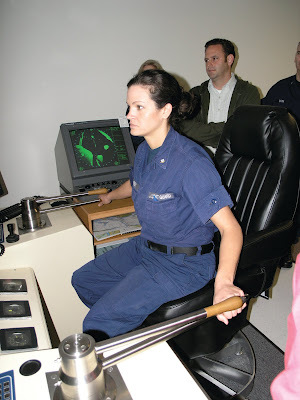 As such, BWU provides an opportunity for Coast Guard personnel to learn the unique characteristics of the inland towing industry from industry experts. Similarly, it provides an opportunity for inland towing industry personnel to learn from Coast Guard experts about USCG regulations, vessel examinations, investigations, and other activities. The curriculum has been updated and BWU now boasts more than 150 “graduates.” Additionally, BWU was recognized as a “best practice” at a recent National Harbor Safety Committee Conference. The development team has completed a final curriculum revision, and future revisions will be scheduled triennially to keep the information current. Additionally, the Eighth Coast Guard District and Sector Houston/Galveston are identifying resources to support BWU in the future, and will continue to schedule the twice-yearly classes. 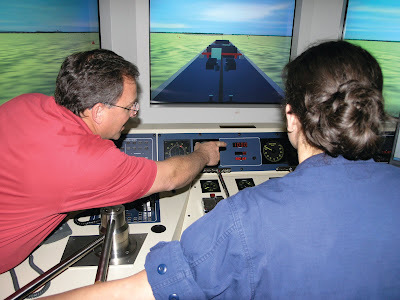 Last picture: MST3 Emily Fulbright operates towboat controls in the Seamen’s Church Institute bridge simulator while Mr. Larry Godfrey observes. You may also want to contact the Merchant Marine Personnel Advisory Committee with your concerns. Information and a link to contact information for committee members is available at http://www.uscg.mil/hq/cg5/cg522/cg5221/merpac.asp.